LITEC showcased a host of new products at ProLight+Sound in Frankfurt. Six new end-plated trusses will substitute old versions of trusses, keeping their excellent size, weight and cost characteristics, though achieving even better resistance and performance. QX30SA square section aluminium truss twist-resistant version with 29 cm long sides substitutes the model QX30S, from which it keeps the excellent size, weight, cost and performance characteristics. It is made of 6082 alloy extruded components, with high load-bearing and twisting strength. 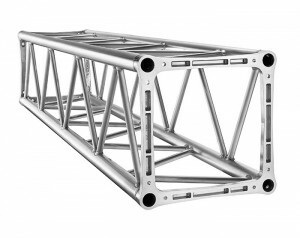 QX40SA square section aluminium truss twist-resistant version with 40 cm long sides replaces the old truss QX40S. It achieves better resistance thanks to the introduction of diagonals on all the faces. Square section heavy duty aluminium truss twist-resistant version with 40 cm long sides now substitutes the old Heavy Duty series QD40S and QD40SA. It is characterized by the introduction of Ø 48x3 mm chords and Ø 20x2 mm diagonals on all the faces. QH30SL square section aluminium truss twist-resistant version with 29 cm long sides is characterised by the introduction of 48mm chords and of a ladder on one face, though keeping the twist-resistant structure. It substitutes the old Heavy Duty series QD30S and QD30SA. 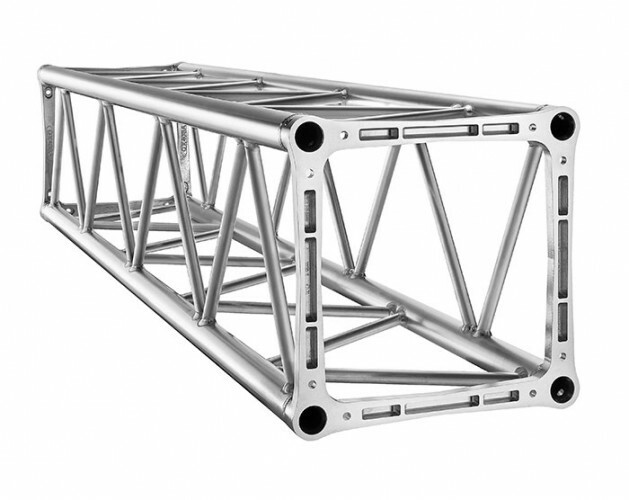 The QH40SL is square section aluminium truss twist-resistant version with 40 cm long sides. It is characterised by the introduction of 48mm chords and of a ladder on one face, though keeping the twist-resistant structure. It substitutes the old Heavy Duty series QD40S and QD40SA. New trussing and lighting clamps are divided in five series: ALI4251, ALI4851, ALI6063, LIC3851 and LIC4851. They stand out for their design and innovative performances. To identify them LITEC have used a micro-percussion technology which reports the family series number and the indication of the safe working load. 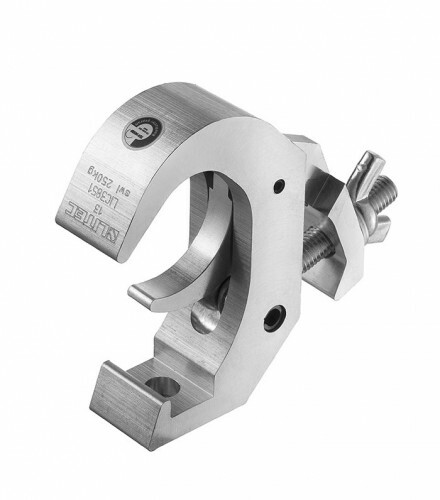 They are all made from ultra-high tensile aluminium alloy and their surface is highly polished. On request they can also be supplied with black powder coated finishing. New EXE Rise chain hoists are 100% made in Italy Electric chain hoists. They comply with BGV German standards, as written in the VPLT directive SQP2. These chain hoists are purpose-designed for theatre and entertainment sector applications. Light and compact, they distinguish themselves for their silence while working and their reliability. After a 20-year experience first in distributing Columbus McKinnon chain hoists at an international level, then the realization of the EXE-Lodestar series responding to the stringent criteria of BGV-C1 regulation and obtaining several prizes for its innovation, and finally the production of the LITEC hoists, the company proposes this new product line which has been totally designed, engineered and built in Italy. Light and compact, EXE Rise chain hoists distinguish themselves for the excellent ratio of performance/cost. The two braking systems (which are independent as they are powered by two additional independent cables) are placed respectively on the motor shaft and on the transmission shaft. This gives the chance to place the clutch system outside the load path. The AC brakes give a unique precision and a real instant response to electrical impulses. That’s why the EXE Rise hoist is really safe. The 5-pocket load wheel, helical gears with permanent grease lubrication and the round chain guide, make the EXE RISE series the most silent of the market. EXE RISE is available in the BGV D8 320 kg, 620 kg, 1120 kg and 2000 kg versions; and in the BGV D8+ 320 kg, 560 kg, and 1000 kg models. 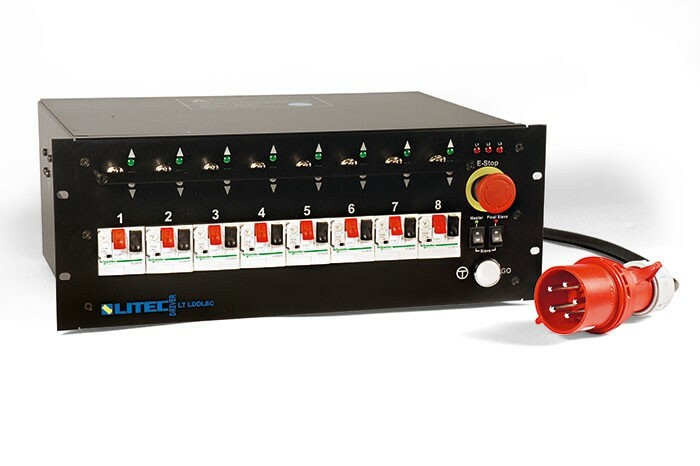 All LITEC Drivers have been designed to meet all peculiar and specific needs of the entertainment sector. They are comfortable, quick and easy to use and, above all, safe. 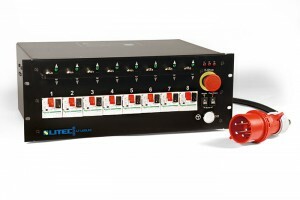 The range features hanging 1 and 2-Channel direct control keypads, and 4 and 8- Channel controllers in 2 and 4- rack-unit chassis. They are furnished with a mobile plug with mechanical phase inverter to manage any 3-phase direct/inverse sequence supply. They are compatible with LITEC and EXE Rise chain hoists, and most chain hoists present on the market from 0.19kW to 1.6kW. Each non-manual control unit has a MCB & RCD Breaker before the power circuit that guarantees for every equipment and a protection against overload and short circuit. In addition to this feature, the DL8-4 series controllers have a release coil operated directly by the Emergency Stop mushroom button, which allows the general power switch to act immediately. In the case of DL models, the real coil function is also extended to the emergency buttons of all control units linked as slaves. The models DL are provided with individual magneto-thermic protections for each channel. 1) Their intervention limit can be individually set by turning the graduated nut on the front, allowing the motor hoist to be checked and protected from excessive wear by preventing the malfunction that can be caused by breakages or overloads. 2) Overload protectors must all be inserted for the GO function of the control units to work –if even a single protector is not inserted, the equipment cannot work. If a motor protector is triggered during operation of the control unit, the equipment stops. 3) When a system of "n" DL-model controls is in operation, any intervention of the overload protector will simultaneously interrupt the work of all chain hoists linked together, ensuring the safety of the whole system. At Prolight+Sound LITEC presented their new digital catalogue designed for tablet use. This work features all the Trussing and Rigging series with many new and updated contents such as new products, special projects, updated technical information and great photo galleries.